Portland Housing Update. Are things OK? The Portland Business Journal ran a special edition on residential real estate in last week’s print edition. I was asked for my thoughts on the market, which are similar to our previous work, and reproduced below. If you can get a copy, there are additional comments and insights from local economists and housing industry experts. 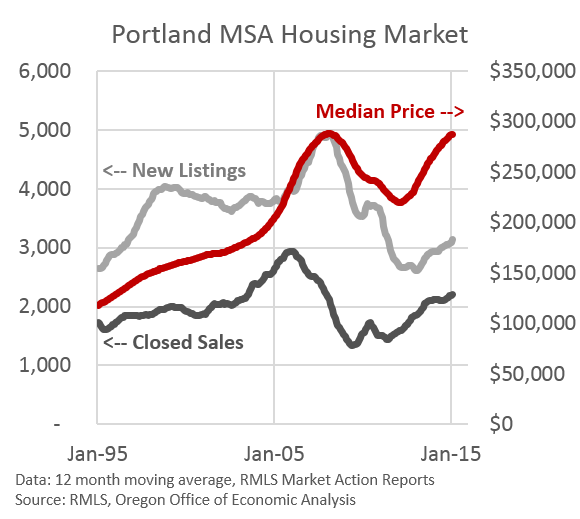 First, prices are booming and and the median sale price, as reported by RMLS, is effectively back to an all-time high. Rents have never been higher. However these gains are driven by the fact that housing demand and household formation have returned to normal but the number of homes for sale or rent, both existing and new, have not. From this high level perspective it’s simple supply and demand. Demand is up considerably from the depths of the Great Recession while housing inventory is not. That’s a clear recipe for rising prices. While new construction today is substantially higher than a few years ago, the actual number of housing permits issued in 2013 and 2014 is only roughly in-line with population gains to the region. 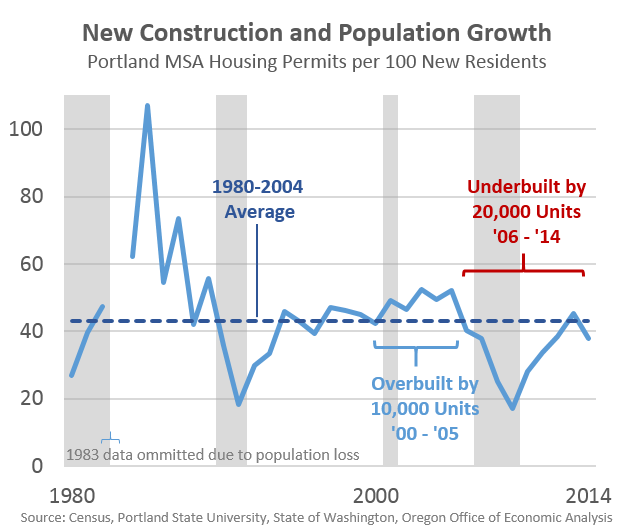 Portland is not currently overbuilding relative to demand. In fact, even with decent numbers in the past two years, the region still likely has a housing shortfall due to many years of underbuilding with the Great Recession, bad economy and tight credit conditions for both buyers and developers. To me, housing affordability is the biggest issue today. We need to ensure that we have enough homes, townhomes, apartments and the like to meet the demands and needs of our growing population. And we need these housing units to be relatively affordable, so that households do not have to squeeze their budgets to such a degree that it impacts their ability to meet their non-housing needs. Worst case scenario would be that housing costs become too high, pushing residents out of the region to more affordable areas. Housing affordability issues apply across the income spectrum, not just to those at the lowest levels. 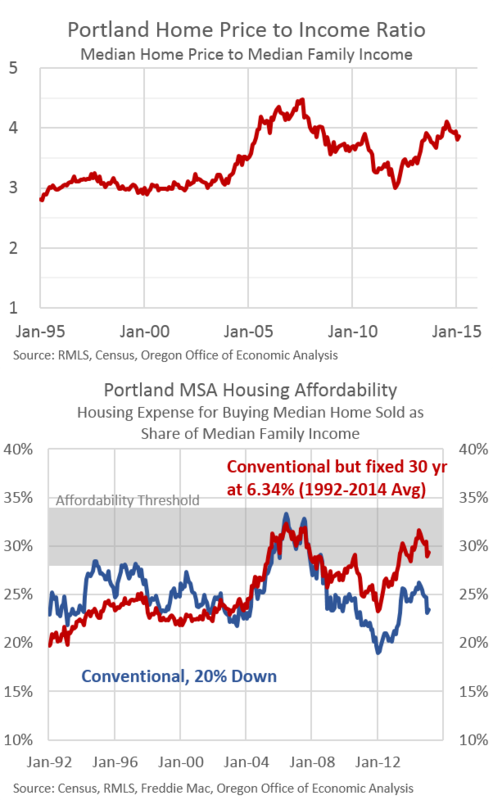 In particular, it is interesting to see how low interest rates impact housing affordability. Right now home prices relative to incomes are about two-thirds of the way back to the bubble era and considerably higher than in decades past. However, due to low interest rates the financing costs of carrying a mortgage and property taxes remains low and in-line with the 1990s or early 2000s. It’s this bottom line look of actual monthly (or annual) ownership costs that buyers ultimately care about, both relative to income and relative to their expectations of home price appreciation. I am interested to see how home prices react, or don’t, to higher interest rates should the Federal Reserve start to raise them later this year, as expected. As the housing market continues its slow march toward normalization, I expect to see the same patterns as in recent years but a little less pronounced. Population growth and housing demand should remain strong, along with a much stronger economy. While the combination of new rental apartments and more new home listings have yet to put a noticeable dent in price growth, I expect that to change in the next year or two. Prices will moderate. Thanks for this. It was always baffling to me that in the run-up to the housing crash, so few people did a simple and obvious median income to median house price comparison. It was clearly on an unsustainable trajectory. Thanks for the comment. We’ve proven ourselves to be susceptible to stories about how this time is different. Over and over again. Even those who did price to income ratios, or more formal modeling, some times even they couldn’t believe the results about what was to come. It’s challenging to be the canary in the coal mine. Ten years ago I told people I thought it was a real estate bubble. However, it’s really hard to convince people who are making bags full of cash flipping houses and condos on the weekend that they should stop. Really hard.